Estampe has a wide selection of both stock and custom automotive early bird envelopes. If our stock early bird envelopes don’t match your needs, please call us so we can help you design a custom drop-off envelope. 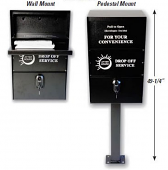 Allowing for 24/7 customer service, night drop envelopes are a great money maker for any auto body shop or repair shop. Our night drop envelopes, some times called early bird envelopes or drop-off envelopes, come pre-printed with complete and easy to understand instructions for your customer. These night drop envelopes help you gather all necessary customer information using a clear and easy to understand format. Early bird envelopes are also great for increasing service sales by using “suggestive selling". Because each is printed with a checklist menu of the most often needed service repairs; this “suggestive selling" checklist menu reminds and encourages the customer to consider requesting additional maintenance and repairs that may have not otherwise occurred to your customer to request. These envelopes include mechanic's lien information and labor authorization to insure a complete understanding between you and your customer. They gather information that includes an estimate, who the estimate was confirmed to, whether the customer wants their old parts returned, information on labor rates, diagnostic fees and much more.